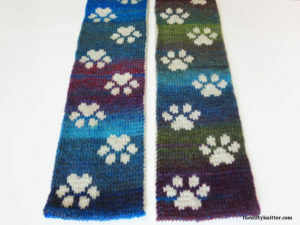 Show off your love for your pets with this adorable pawprints scarf. 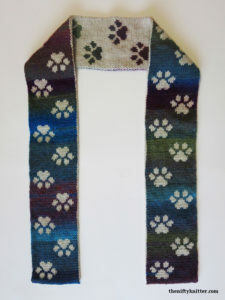 Double knit, this thick scarf is fully reversible, featuring opposite color schemes on each side. 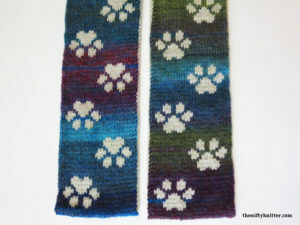 Pawprints decorate the entire length of each side of the scarf. 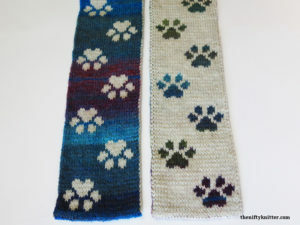 Use color changing yarn for interesting color combinations or solid yarn for a more classic look. Full instructions are included for the double knitting technique. The finished length is approximately 67 inches (170 cm), and can easily be increased or decreased. Approximately 275-325 yards each of two contrasting colors of worsted weight yarn for an approximately 67 inch (170 cm) length scarf.